The population doubles every 40 years. In 100 years there will be 100 times as many people living on the earth. All will suffer the lack of food and water. Many will die and wars will be over resources. Never mind that the UN projections show a world population of 7 billion today reaching a peak of about 10-11 billion by 2100. Never mind that global fertility is declining fast. Never mind that a doubling every 40 years would need some 265 years to reach a factor of 100. Never mind that in 100 years the growth would be by a factor of 6.6. Peter Ray seems to be calculating by his strange mathematics a population of 700 billion in 100 years (though quite how he calculates this is a mystery). The rest of the article is conventional gloom and doom gibberish but masochists can find it here. 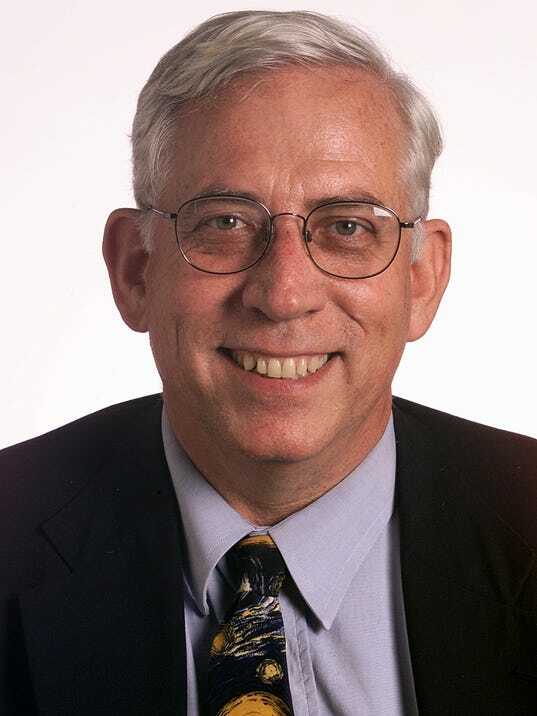 However I thought it odd that somebody so numerically illiterate – in a public article – could be a Professor of Meteorology, which led me to the Florida State University page of a Professor Peter S Ray which in turn led me to his homepage and then on to his cv. He is the only Peter Ray listed. The pictures – if all of the same person – seem a little anachronistic. Presumably the Tallahassee Democrat picture was chosen as being the most flattering but I would guess it is from 20 years ago. Personally I would prefer the later picture. The “back to the future” theme appears also in his cv where his PhD (Meteorology) is from 1973 but his MS (Meteorology) is from 2013. It is not inconceivable that a Masters degree could follow a PhD, but in the same field? I get worried when Professors start spouting about matters outside their own narrow fields. They are imbued with an authority they do not have and – more often than not – are misguided and misinformed. We could call it the Newton’s Alchemy Syndrome (NAS). Professor Peter Ray should probably avoid demographics. In Iran the Ayatollah Khamenei has announced his 14 point plan (or directive) to try and revive the fertlity rate which is at a potentially catastrophic low. In the US, Hispanic fertility rates have – in recent times – held the fertility rate up just above the replacement level of 2.1. In China the one-child policy has been withdrawn as population has reached its peak and will now decline significantly. In country after country, fertility rates are lower than the replenishment rate. In half the states in India the rate is already below 2.1. By 2050 the total Indian population will start to decline. Generally improvement in living standards with more attention to women’s rights are accompanied by a sharp decline in fertility rates. Now however, the recession is being blamed for the decline in the US. 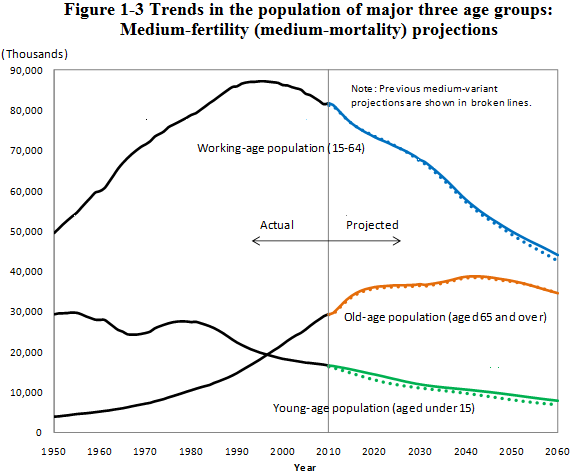 Till 2100 the main demographic challenge is increasingly going to be the long term decline in fertility and the increasing proportion of the “aged” relative to the working population. U.S. fertility is not recovering from the financial crisis — and demographers aren’t sure why. The fertility rate fell to a record low 62.9 births per 1,000 women aged 15-44 in 2013, according to the National Center for Health Statistics. The total number of births, at 3.96 million, inched up by a mere 4,000 from 2012, the first increase since the financial crisis. But the total fertility rate, or TFR, the average number of children a woman would have during her child-bearing years, fell to just 1.86, the lowest rate in 27 years. TFR is considered the best metric of fertility. A TFR of 2.1 represents a stable population, with children replacing parents as they die off. Demographers expected the fertility rate to fall during recession, as financially strapped families put off childbearing. But what has surprised some demographers is both the depth of the decline and the fact that fertility has continued to drop even over the course of the country’s five years of slow but steady recovery. The rate has fallen steadily each year since 2007, when it stood at 2.1 ……..
One foreseen factor behind the dropoff in childbearing is the rapid decline in Hispanic-American fertility. For several decades, high Hispanic childbearing has been driving U.S. population growth. White fertility has been under the 2.1 replacement rate for decades, and ranged from 1.7 to 1.9 in the 2000s. The TFR for black Americans first fell below 2.1 in the early 2000s. But the number of children per Hispanic-American woman has plummeted from just under three in 1990 and 2.7 as recently as 2008 to 2.19 in 2012, just above the replacement rate. That decline has been mirrored in other Hispanic countries. Mexico’s TFR has fallen precipitously, from 6.7 in 1970 to 2.2 in 2012, according to the World Bank. A similar decline has taken place in El Salvador, and to a lesser extent Honduras and Guatemala, all three prominent countries of origin for American Hispanics. …. My grandfathers died around 80 years ago. They could not have conceived of the world their grandchildren would live in and the challenges they and their world would face. They would surely have been able to recognise our behavioural characteristics but they would not have been able to imagine the society we live in. The values of current society would have been difficult for them to understand. My father died 26 years ago. Not so very long ago. Yet he would not have been able to predict – let alone address – the kinds of challenges my children and the world they live in will face in the next 20 – 30 years. His values were those of having fought in WW2 and the hope of the 1950’s. He would not have been able to predict the pace of life and the networks maintained by my children. He could not have forecast the day-to-day problems they will face or the “big problems” their world will face over the next 50 or 60 years. Around 100 years ago my grandfathers could not have foreseen the Second World War or the spread of easily available and affordable electrical power, or of the second industrial revolution or the digital revolution. Even if they could have foreseen the future they would have had the intelligence but not the knowledge or the technology to better address the challenges of today. In fact they would have been very stupid to have tried to forecast and then plan for their choice of problems to be faced by their grandchildren. Our children’s children will live into the 22nd century. Any forecast I try to make of the development of technologies and knowledge and societies and values 100 years from now is going to be wrong. For the last 50 or 60 years we have lived with the perception of the problem of population rise and limitation of resources. Actions have been taken – and very successfully – to reduce the number of births, to improve food production and in finding new and alternate resources. In another 50 years populations will decline and the pressure on resources will decline further as new technologies are developed and new resources are found (who would have predicted the abundance of shale gas 50 years ago?). We may expect that in the 22nd century, one of the major challenges will be that of population decline and aging. It will be a challenge faced and solved by the humans of a hundred years hence and it may or may not be a problem. I have no idea of what genetic and medical advances may bring or of how societies will develop and of the value systems that may prevail then. To use today’s knowledge and technologies and values to address these presumed challenges of the future is both ineffective and wasteful. These challenges – if challenges – will be faced by our children’s children using the knowledge and technology that will have become available to them. It would have been ridiculous for my parents or my grandparents to have given up advances in their own well-being or their careers or their world – as they saw them then – for the sake of some unknown problem that would be faced by their children’s children. And so I am deeply suspicious of any politician or environmentalist who wants me to do something – or not do something – against my current best interests as I see them – for the sake of my children’s children. Our grandchildren will always be better placed to define their challenges than we can possibly forecast. They will be better equipped to solve the problems of their age with the tools and knowledge and technologies of their age. And they too would be stupid if they gave up their own well-being in order to solve a problem they choose to forecast for their children’s children. In times of high unemployment the anti-immigration voices are raised very high everywhere and especially in many European countries. Much of the sentiment is rooted in racist views whether against those of Asian or African or East European origin. In Japan it is seen as threatening the homogeneity of the country. But what every politician well knows – but which some will not dare to admit for fear of losing their populist base – is that without net immigration in, OECD countries will face an increasing crisis of declining populations, declining labour force and an increase in the proportion of the aged. They are all very well aware that expanding the working population to at least match the increase in the “aged” proportion is critical to maintaining the standard of welfare and health care that they have become accustomed to. Increasing the retirement age – which is already on the table as trial balloons – is unavoidable because even with immigration the proportion of the working population relative to the “aged” is in decline. In OECD countries fertility rates are already well below the replacement level of 2.1 per woman. It is higher only in Israel, Iceland and New Zealand, and in India, South Africa and Indonesia. China is already down at 1.6 and India is down to 2.63 and declining fast. Despite the drop in the birth rate, France remains second only to Ireland when it comes to Europe’s most fertile nations. Women in Ireland, where the population is 4.6 million, had on average 2.01 children each in 2013. Korea, Hungary, Spain and Japan are the other countries where fertility rates are less than 1.4. Total fertility rates in OECD countries have declined dramatically over the past few decades, falling on average from 2.7 in 1970 to 1.7 children per woman of childbearing age in the 2000s. In all OECD countries, fertility rates declined for young women and increased at older ages. 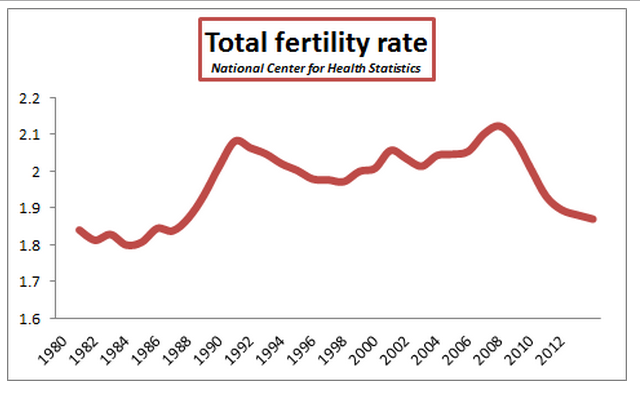 A modest recovery in total fertility rates started in the early 2000’s, to an average level of 1.7 in 2010. The total fertility rate is below its replacement level of 2.1 in most OECD countries except Israel, Iceland and New Zealand, and in India, South Africa and Indonesia. 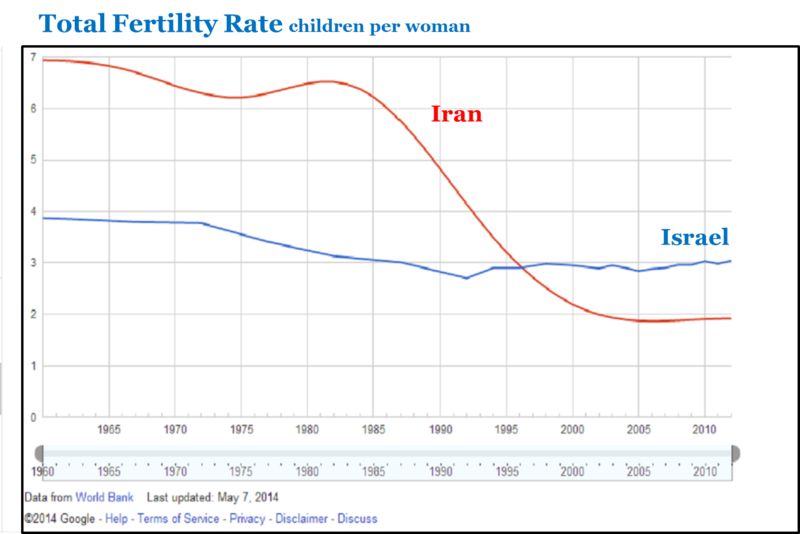 The last few years have seen various trends emerge in fertility rates. A drop in fertility rates has occurred, for example in Australia, New Zealand, Spain and the United States, while rates have continued to rise in Iceland, Israel, Sweden, and Switzerland. 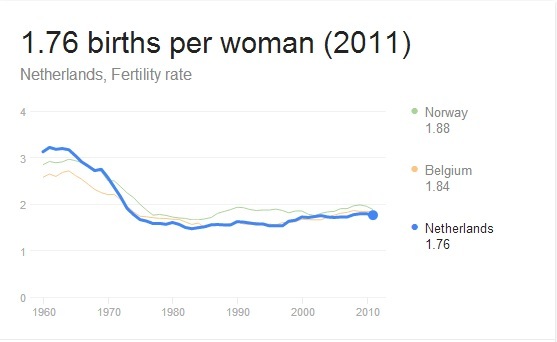 The increase in fertility stopped in many other countries. The effect of the economic downturn is as yet unknown, but persistent economic uncertainties can impact downward the number of children women may have over their reproductive life. 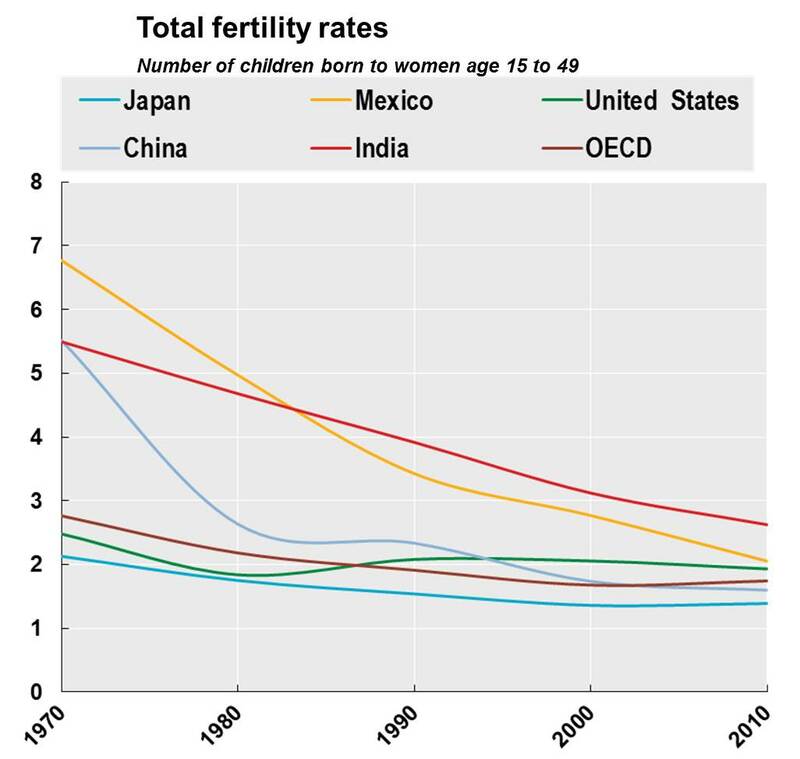 The difference between the decline in fertility rates between India and China is of particular interest. While some of the difference is due to different rates of development, most of the difference can be attributed to the draconian one-child policy in China. But that is now being relaxed as the coming decline in the Chinese population becomes obvious.. The shortages of the proportion of working population – unless immigration is used to mitigate the shortfall – is inevitable and will really begin to bite over the next twenty years or so. It has been calculated that there is a high probability that somebody already born will live to see 200 years. That is just a probability of course but if in 2213 it turns out to be true it is likely to be a woman. There are 54,000 Chinese who are over 100 years old and about 80% of them are women. And the oldest one is Alimihan Seyiti, an Uygur who is 127 years old and was born on June 25, 1886. She is said to have 56 descendants. The claim is still being verified and there are many so called “experts” who doubt the claim. Alimihan Seyiti from Kashgar, near the border with Kyrgyzstan, was born on June 25, 1886, said ts.cn, a government website in Xinjiang – when Grover Cleveland was president of the United States and William Gladstone the British prime minister. …. At the time of Seyiti’s supposed birth much of Xinjiang was ruled by Yakub Beg, a Tajik warlord, while Russia held other parts of the region. About four-fifths of the more than 54,000 living Chinese centenarians are women, and a 127-year-old woman from northwest China is the oldest of them all, according to figures released on Wednesday. The Geriatric Society of China (GSC) claimed the oldest person in China is Alimihan Seyiti, a Uygur who was born on June 25, 1886. She lives in Shule County in Xinjiang Uygur Autonomous Region. If verified, Seyiti could be the oldest person in the world, beating by five years the Guinness World Record of 122 set by Jeanne Calment from France. Seyiti was honored by the GSC in June as the oldest person in China after the death of Luo Meizhen in Guangxi Zhuang Autonomous Region, who was born in 1885. Xinjiang, Hunan, Yunnan, Shandong, Guangxi and Sichuan are home to China’s 10 oldest supercentenarians (those who have attained the age of at least 110), and their average age is 119.2 years. According to GSC figures, rural centenarians outnumber their urban counterparts. Among the 54,166 Chinese centenarians, about three-quarters, or more than 74 percent, are from the countryside. The GSC also published a list of the 10 oldest couples in China, who are now living in the provinces of Hainan, Henan, Liaoning, Fujian and Shanghai Municipality. According to the GSC, the oldest living couple are Ping Muhu and his wife Zhang Xinniu from Yuzhou City in central China’s Henan Province, whose combined age stands at 213 years. The average combined age of the 10 oldest couples in China is 207.7 years. Washington Post: Dozens were feared dead after a boat filled with migrants capsized in the Mediterranean Sea about 70 miles south of the Italian island of Lampedusa, just a week after more than 300 migrants died when their boat sank near the same island south of Sicily. At least 50 are known to have died yesterday including at least 3 small children. The EU – we should not forget – won the Nobel Peace Prize last year. Which only goes to show how ridiculous the Nobel Peace Prize and the Norwegian Nobel Committee has become. And while the EU rests on its laurels, the Mediterranean is fast becoming the graveyard of the Château d’EU (with apologies to Alexandre Dumas). It is not that I am advocating open borders for the EU (though there will be a time in the distant future when nation states and national boundaries will become obsolete). But nearly all the countries of the EU need – in the long-term – to improve the ratio of their working population to their supported populations (notwithstanding the short-term high unemployment that currently reigns in some countries). It was the EU which supported the overthrow of the old regime in Tunisia. It was the EU itself which was so keen to bomb Libya and cannot now escape from the consequences. It is the EU which is supporting Al Qaida in Syria by supporting the “rebels” and that too will have long term consequences. When Assad’s regime prevails – as it seems to be doing – where will all the “rebel” Syrians turn? The EU was all too quick to support the overthrow of Mubarak without realising what the Muslim Brotherhood would bring. It is in the EU’s long-term self interest to develop a pro-active – and therefore orderly – immigration policy in the countries outside its borders. It is politicians in the ruling parties across Europe who have to stop pandering to nationalistic, short-term populism and have the courage to lead their countries to face up to the long term demographic challenges. And that cannot happen with a Fortress Europe policy. With a Château d’EU surrounded by watery graveyards. Maltese PM Joseph Muscat has said European waters close to Africa are turning into a cemetery, after another boat laden with migrants capsized. Mr Muscat said Malta felt “abandoned” by the rest of Europe and insisted that the EU had to take action. Malta and Italy launched a rescue operation after a boat capsized on Friday, leaving up to 50 people dead. 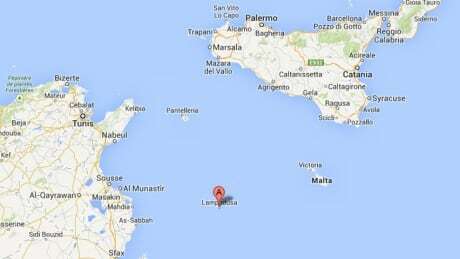 It happened 120km (70 miles) off Lampedusa, the Italian island where at least 300 migrants drowned last week. The loss of life has renewed the debate within EU member states on migration rules. In the latest incident, the vessel carrying more than 200 migrants is believed to have encountered difficulties in Maltese waters just before sunset on Friday. The migrants used a satellite phone to raise the alarm but the boat capsized when passengers crowded to one side as they tried to get the attention of a passing aircraft, the Maltese navy said. …. Also on Friday, a separate boat accident off the Egyptian port of Alexandria claimed the lives of at least 12 migrants. The Japanese deputy prime minister Taro Aso kicked up a storm of controversy Monday with his comments on the financial burden the elderly place on society. “This won’t be solved unless you let them hurry up and die.” …. Aso is no stranger to controversy: the former prime minister once said he wanted to make Japan the kind of country where “the richest Jews would want to live,” and compared the opposition to the Nazis. But the fact is that he is the first politician who has dared to defy political correctness – his subsequent apology notwithstanding – and address what is likely to be Japan’s most serious challenge within the next decade. It is a challenge that is going to come to dominate the realities in Europe as well. In the US – and in some countries in Europe – it is the continuing immigration into the ranks of the productive population which helps to keep this challenge a little further away in the future. In any event it will be population decline that is the global issue within one hundred years. Globally the proportion of productive population to elderly population will not be so wrong – but it will be too low where population is declining unless active measures to keep this in balance are taken. The latest data from the Japanese National Institute of Population show why Aso is so alarmed. The projections for the next few years of the rate at which the productive population is declining are alarming. Increasing the birth rate is a long term measure and that assuming that birth rate can be increased. In the short term it has to be immigration into the productive portion of the population which can have an effect (assuming of course that they can contribute to growth). But before the demographic challenge can be addressed it has to be acknowledged and maybe Aso’s outburst – unpleasant as it is – will bring the issue to the table. There are still alarmists and Malthusians who believe that the world will face catastrophe due to overpopulation. They believe that the carrying capacity of the earth has been exceeded, that there will be food shortages, energy shortages and resource shortages in every field; that – in short – the population will not be able to sustain itself let alone to maintain growth. But like so many alarmist theories (be it global warming or peak oil or peak gas or GM crops) the overpopulation meme builds on beliefs and ignores evidence. The environmentalists are increasingly taking faith-based and anti-science positions. Alarmism invokes political correctness and “consensus beliefs” rather than evidence to silence criticism . Even hard-core environmentalists are beginning to question this myopic adhesion to ideology (Environment360). Just taking the overpopulation myth as an example, the data and projections in the United Nations, Department of Economic and Social Affairs, Population Division (2011): World Population Prospects: The 2010 Revision. New York (Updated: 15 April 2011) are pretty unambiguous and revealing. Within 100 years world population will be declining. The majority of children being born today in the developed world will live to be over 100 years old. There will begin to be a shortage of the required “productive population” relative to the “supported populations of the young and the retired” – a problem already evident in Japan and other developed countries. In Sweden (and some other European countries) for example, this proportion is being maintained only by means of immigration and the slight consequent increase in average fertility rates. The “productive population” in Germany would be below the required level were it not for the “guest workers”. The 11 million or so “illegal immigrants” who are nearly all part of the “productive population” in the US are a vital part of maintaining this balance. The challenge in 2100 will be to maintain the balance between those “producing” to those “supported” in a declining and aging population. Perhaps immigration or population migrations or productivity increases by the use of robots and an increase in the age one joins the “supported” population will be parts of the solution. I have no doubt that solutions will be found, but the “overpopulation problem” would have left the stage.